The flavor of South Florida is distinctively Cuban. You'll find grits, biscuits and gravy, barbecued ribs and grapefruit there, as you might expect. But you're much more likely to find yellow rice, Cuban bread, black beans, roast pork or chicken marinated in sour orange or lime juice, and flan. Plantains, the sweet smaller cousin of the banana, are common side dishes, as are mangoes. As I am a northerner by birth and residence, I did not discover Cuban food until I first went to southern Florida about ten years ago. Since that time, the cuisine is one of my favorites -- colorful, delicious and hardy, I consider it a kind of Southern soul food. A new coffee table-sized book celebrating this cuisine, Our Latin Table by Cuban-born Fernando Saralegui, has just been published. Saralegui has spent 25 years in the restaurant industry. His book is lovely; its cover in yellow, pink and orange tones alerts the reader that this is a joyous culture and cuisine. Our Latin Table is arranged by events, memories and holidays, and includes pictures not only of food but also of the author's extended family. A few alcoholic beverages are included, as is dark, sweet Cuban coffee. Although the primary focus is on the recipes, three distinctive features bear mentioning, as well. First, and perhaps the most essential, is "A Latin Pantry," including all the essential ingredients to have on hand if you want to cook "with Latin flavor." Cooks will find several of these items on their pantry shelves, but may need to stock up on frozen yucca (a potato-like tuber), jalapenos, guava paste and chorizo, the Latin sausage of choice. The next two pages are devoted to a glossary of terms, helpful in cooking and in reading menus. Empanada, a pancake type offering filled with ingredients like spinach, queso blanco cheese, onions and garlic, and masa harina, a coarse cornmeal, are among them. Finally, at the end of the book is a resource page with companies that mail order related products. "Whether you're in the middle of nowhere [like me!] or just lazy," the author writes, this will help you find catalogs or on-line information. Some retailers are in Manhattan, others in L.A. or Florida. All look mighty dangerous. Although all the dishes look fascinating and delectable, the ones that please me the most are the thick, somewhat unusual soups. These include black bean, corn chowder, garlic-lime, white gazpacho with crab and others. The roasted red pepper soup is a deep red color and can be made with either chicken or vegetable stock, depending on your guests. All sound relatively easy to prepare and sound mouthwateringly nourishing. The difficulty with these coffee table books is that they present a dilemma. Do you display them for friends to look at while you're cooking them dinner, or do you put them on your cookbook shelf, which may be too narrow to hold it? My preference is always for a more conveniently smaller-sized, modest cookbook, one that you don't mind getting food splatters on. 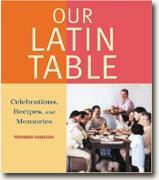 Whichever type of book you prefer, this new Latin cookbook is attractive and full of many new ideas. Reading it will make you hungry.